HYDERABAD: The Sindh Agriculture University (SAU) has allowed chopping down and sale of trees in its premises. The move, according to its critics, smacks of an irregularity besides entailing environmental implications. “Environmentally, cutting a tree is like killing a human,” said a professor who is one of the opponents of the allegedly recurrent practice of cutting the trees at SAU. He requested anonymity. According to a notification dated June 5, the varsity’s Tree Auction Committee, in its meeting headed by Vice-Chancellor (VC) Prof Dr Mujeebuddin Sahrai, approved the highest bid of Rs250,000 for 50 trees, including neem, jambolan, rosewood, eucalyptus and four other species sold at Rs5,000 per tree. The trees were chopped down on Thursday. A sports ground is in close proximity of the area from where the trees were uprooted. The critics allege that there was no justifiable reason to cut the trees and that they have been sold on cheap rates. Another professor, who also requested anonymity, said the trees had been sold on cheap rates. According to him, a mature rosewood tree is priced at least between Rs25,000 to Rs30,000, whereas a neem tree should not be sold below Rs20,000. “All of these trees were planted 10 to 15 years ago and were mature trees. Their average worth shouldn’t have been less than Rs20,000 per tree,” he maintained. Another SAU teacher, who claimed to have been constantly opposing the tree cutting, alleged that the practice paced up after Prof Sahrai was appointed as the VC. “Around a thousand trees have been cut since VC Sahrai took over the charge,” he said, adding that there was an area in the varsity with a large number of unwanted trees but the VC did not order to chop down those trees as they would either not be sold or would fetch a very low price. An official bewailed that due to the tree cutting, one of the greenest universities of the province, located in Tando Jam, a rural town in Hyderabad, is being shorn of its beauty, besides the environmental damage. 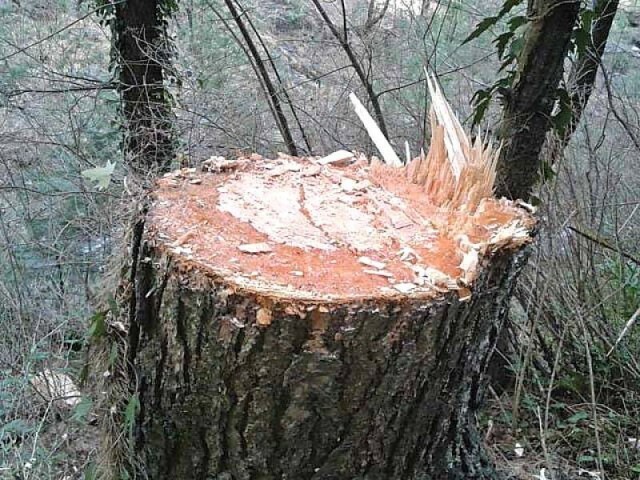 SAU Spokesperson Asghar Bhatti, however, told The Express Tribune that the trees had been chopped down to construct a service road. The road would connect the animal husbandry and veterinary sciences department to the crop production faculty and the admin bloc, he said. Explaining the need of the service raod, the spokesperson said at present, teachers, students and staff moving between the three locations had to detour through Hyderabad-Mirpurkhas Highway, which posed risk of accident. He claimed that the auction for trees was done in a transparent manner through bidding and that the contractor who made the highest bid was given the trees.